We bought our 1987 YJ 4.2L used. It had a working starter on it and then a few months later it burned out. 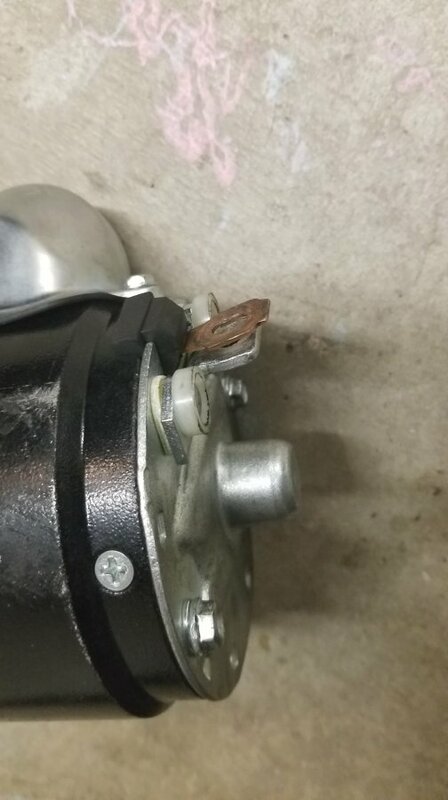 We bought a new starter at O'Reillys Auto in Southern California. The starter made a grinding sound like the gear was running against thin tin. We took the starter back and tried another. Same thing. Went through three starters. Finally, took it to a shop that specializes in Jeeps and the mechanic said we pretty much ruined the flywheel teeth. Took the Jeep home and replaced the flywheel ourselves ( that was one big job!!). Put a starter on it. Same thing. Took it back to the shop and he tried several starters from different companies including NAPA. Same problem. He recommended we buy a starter from Quadratec which we did. The starter they sent us was much smaller AND it had two posts for hooking up wires where our starter only had one post for the cable off the positive terminal of the starter solenoid which is mounted on the firewall. Also, the new starter already has a starter solenoid. We researched the connections and it was recommended on ta forum to jump the two posts and connect it with the one cable. The starter works, but the drive gear does not reach the flywheel. We are at the end of our rope. Where do we get a starter that will actually work? Anyone who can give us some info, PLEASE help!! Pictured below are the two starters side by side and the single pole hook up on the "original" starter. I would buy a genuine factory original Jeep starter. Either buy a brand new Jeep starter or buy a used genuine Jeep part from the junkyard and a have a local shop rebuild it. The local shop should use US, German or Japanese parts. Most auto parts stores sell cheap crappy Chinese made and/or refurbished parts, some that even come with a "Lifetime Warranty". These parts are poorly manufactured and/or made with inferior materials. They are often out of specification, or even failed, right out of the box. The ones that are not faulty many times will have a short service life before they fail. Always buy top quality replacement parts and genuine Jeep engine sensors. Numerous threads detail long and frustrating searches for a "problem" that ended up being cured simply with genuine Jeep repair parts. Cheap parts are cheap for a reason. You also need to find an auto parts store that has counter people that can find their arse with both hands at once. You either received the incorrect part, or somebody managed to put the wrong part in the right box. Are you 100% sure of the block you have? All those starters and none of them worked, to me means that one of the other components is an aftermarket switch. Since you replaced the flywheel that leaves the crank or the block. One of the two is positioning the flywheel out of the starter's reach. If you can find a 4.0 starter you could try that, but I don't know if there is much difference. The problem with vehicles as old and well worked as our YJs is that you never know what "modifications" have been made before you got it. My ‘89 2.5 had a bolt-up starter that used shims to set the starter to flywheel, Chevy style. ^^^^ I have run into some weird scenarios a few times in my career where people swapped things out be it a different year block, flywheel, blah blah blah. It really sounds like a situation where you have a Frankenbuild. '87 used an oddball flywheel and starter. If you study part numbers on rockauto, you will see. If you had used an '88 or later flywheel when you changed it, you could used the '88 and later starter. There is a lot of screwups out there on this, due to so many drivetrain swaps going on. But this has been documented on JF many times. BTW, 2.5 is totally different. Sorry to see this. If you can PM me your order number we can take a look into this.